PACs (or Political Action Committees) are political organizations financed and administered by labor unions, corporations or trade associations. Both PACs and Super PACs were created to influence elections and support parties or candidates, although they employ different means and ways to achieve their goals. PACs were created in the 1940s, while Super PACs are a more recent creation (2010) stemmed from a decision of the Supreme Court in the Citizens United v FEC case in 2010. While the two organizations seem to have similar roles and interests, they are subject to different sets of rules and regulations. Support and investments of corporations and private citizens has played – and continues to play – a major role in affecting the outcome of state and federal elections in the United States, where the cost of political campaigns has grown exponentially. At the same time, the involvement of corporations and financial institutions in the electoral process – mainly through donations and contributions – has sparked debate around issues of corruption and favoritism. The term PAC stands for Political Alliance Committee and refers to political groups (or organizations) controlled and administered by firms, labor unions or corporations that invest money in elections. PACs cannot be ran by individual candidates or parties, but can directly donate money to the candidate or party they support. Most PACs are created to represent or support political or ideological interests, and direct their fuds towards candidates or parties with similar ideals. Unlikely Super PACs, PACs can directly donate funds to their chosen candidate, although they cannot exceed donations of $5,000 per election (primary, secondary, etc.). In addition, they can donate $15,000 every year to any national party committee, and an additional $5,000 to any other PAC. At the same time, they can only accept a maximum of $5,000 annually from any individual, firm, corporation, national party committee or PAC. The first PAC was created in 1944 by the Congress of Industrial Organization to promote the re-election of President Franklin Roosevelt. Today, the number of PACs has grown exponentially, and all PACs must register with the FEC (Federal Election Committee) within ten days of their creation. Upon registration, PACs need to provide name and address for the organization, as well as the details of their treasurers and any connected groups (if applicable). Super PACs are a more recent creation compared to traditional Political Action Committees. They first appeared in 2010 following a decision of the Supreme Court in the Citizens United v FEC case. In 2007, the conservative, not for profit, organization Citizens United wanted to air a film (Hillary: The Movie), shortly before the elections, that was critical of Hillary Clinton, who was then running for elections. Airing the movie was against the 2002 Bipartisan Campaign Reform Act, which prohibited unions and corporations from promoting and airing broadcast, cable or satellite communication mentioning a candidate 60 days before a general election or 30 days before a primary. The United States District Court for the District of Columbia ruled in favor of the Bipartisan Campaign Reform Act – thus prohibiting Citizens United from promoting the film and broadcasters from airing within 30 days of the 2008 primary elections. But the Supreme Court overruled the decision, eliminating the provisions prohibiting nonprofit organizations and corporations from supporting (financially) the so called “electioneering communications,” providing that the sponsors of advertisement are duly disclosed. Super PACs cannot directly donate money to parties or candidates, but can raise unlimited amounts of money from donors, unions and corporations, without having to respect the $5,000 cap. The funds raised can be used to advocate for or advertise against political candidates or parties. Both have also been seen as ways in which corporations and finance institutions can interfere in the political sphere of the country, although the criticism is more focused on Super PACs, which do not have any limits in fund raising and spending. 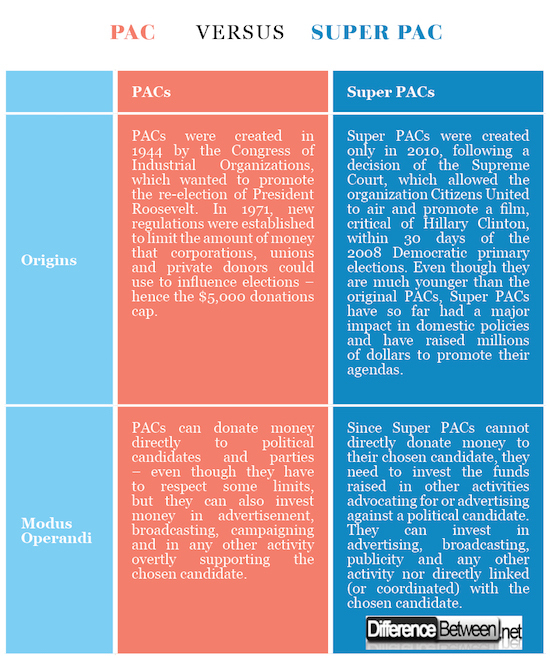 What is the Difference between PAC and Super PAC? PACs can donate the money directly to their chosen candidate, or party, while Super PACs cannot coordinate with the candidate and are prohibited from donating money directly to political candidates or parties. This is a key difference between the two, and deeply affects the way in which PACs and Super PACs operate. Building on the differences highlighted in the previous section, we can identify few other aspects that differentiate PACs from Super PACs. While the private sector has always somehow influenced the outcome of political elections, the creation of Super PACs in 2010 significantly changed the relation between money and politics in the United States. The abolition of restrictions in financial contributions to political candidates and parties, has allowed corporations and financial institutions to use all their leverage – without significant limitations – to lobby for their chosen parties and candidates. 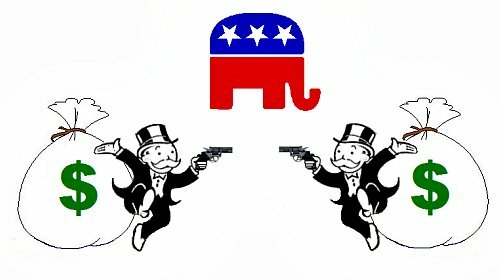 Understanding economic ties between corporations, PACs, Super PACs and similar organizations has become necessary to understand US politic. The ethical implications of the existence of such privately-owned organizations that have the ability to interfere in the political aspect of the country has often been questioned, but the existing regulations have done little to prevent financial authorities and corporations from influencing the political elite of the country. While PACs had and have some restrictions on the amount of money they can receive from donors (be they private citizens, corporations, or other political action committees), Super PACs are allowed to receive unlimited donations (from corporations, individuals, financial institutions, labor unions, trade associations, etc.) to use for their purposes, but they cannot directly donate money to candidates and parties. The shift from PACs to Super PACs – even though the original Political Action Committees still exist – has allowed private organizations to spend unlimited funds to subject opposing candidates to attacks and to advocate for the election of their chosen candidate. Therefore, monetary arrangements that emerge between PACs, Super PACs and the political establishment must necessarily been taken into account when analyzing and assessing the US political landscape. Giulia Squadrin. "Difference Between PAC and Super PAC." DifferenceBetween.net. April 3, 2018 < http://www.differencebetween.net/miscellaneous/politics/difference-between-pac-and-super-pac/ >. Briffault, Richard. "Super PACs." Minn. L. Rev. 96 (2011): 1644. Higgins, Michael. "Political action committees." (2009): 1081-1083. Kang, Michael S. "The year of the super PAC." Geo. Wash. L. Rev. 81 (2013): 1902.